Who would have thought that a tiny fish could change how healthcare providers study human health? This small fish serves as an important tool in scientific research. 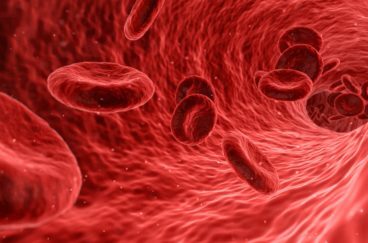 Believe it or not, it has become a big player in the fight against blood clots. Zebrafish are small freshwater fish that belong to the minnow family. These important little fish originate from the Himalayan region, but can be found in household aquariums across the United States. Zebrafish were first used in scientific research in the 1970s. 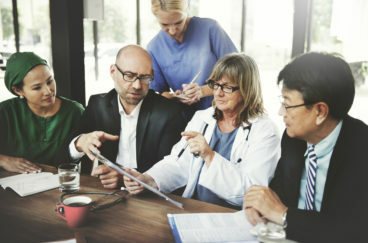 Today, they are used in laboratories to research a wide range of topics because they can be used to model biological systems, such as the human body. Their genome, or complete set of genetic material, has been fully sequenced and is well understood. They also reproduce quickly, allowing for multiple generations to be observed in a short time span. 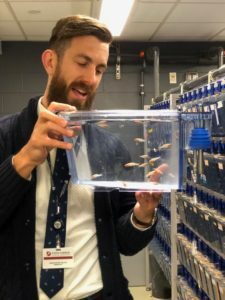 At Brigham and Women’s Hospital in Boston, these fish play an important role in groundbreaking research. They are used in research done by oncologists, developmental biologists, cardiologists, and more. 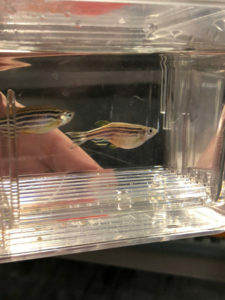 Dr. Kithcart uses the zebrafish to study cardiovascular health and acknowledges that it may surprise people to learn that a small fish can be used to carry out research related to the human body. In the lab, the zebrafish are raised in nursery tanks to start their lives and then are moved to new tanks when they reach 3 months of age. That is when they are considered fully developed and start to lay eggs. Their tanks are designed to mimic their natural environments. “Zebrafish have been raised in lab environments for decades now. 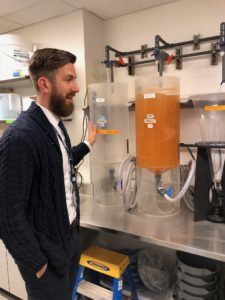 So, we’re very used to being able to raise them in an artificial environment, but we try to mimic, as much as possible, their native environment,” explained Dr. Kithcart. 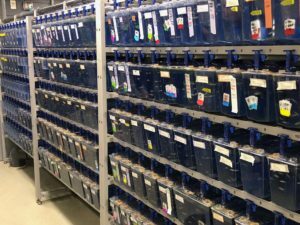 The zebrafish lab at Brigham and Women’s maintains the lab at a warm 78 degrees, closer to the fish’s natural temperature, and they have a strict light cycle, where the lights are turned on at 8 am and off at 10 pm. This light cycle mimics the light cycle of the fish’s natural environment. Their diet consists of brine shrimp prepared in the lab. In the zebrafish lab, Dr. Kithcart uses genome editing to study cardiovascular health. Using a technology called “CRISPR,” researchers like Dr. Kithcart can change the genes of the fish so that they express different traits. CRISPR stands for “Clustered Regularly Interspaced Short Palindromic Repeats.” It works by targeting and editing specific pieces of DNA, which leads to changes in how different genetic traits are expressed. 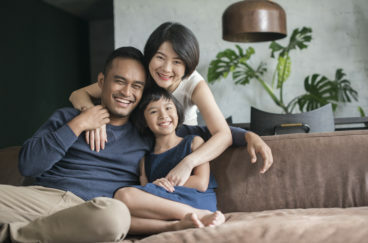 It all starts when the fish egg is first fertilized and exists as a single cell. 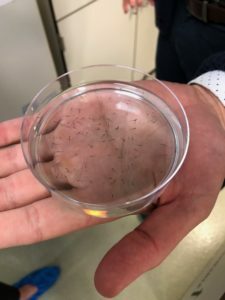 By using CRISPR and other forms of genetic manipulation, the Brigham and Women’s lab has been able to create several different strands of zebrafish to help study cardiovascular health. 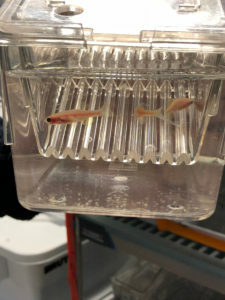 Several strands of zebrafish in Brigham and Women’s lab have been genetically modified using transgenic manipulations to glow under the right lighting. 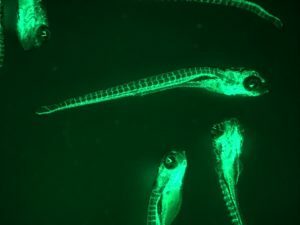 Researchers use this lighting to observe the fish under a microscope. Two of these strands are known as IGM GFP and FlkGFP. B cells are a form of white blood cell that play an important role in the immune system. In addition to genetically modifying the fish for research, researchers can change the fish’s diet and environment to study different topics. Some of the zebrafish are used to study the effects of an unhealthy diet on the cardiovascular system. “We have fish that are being fed a high cholesterol diet. We feed them an ‘Americanized’ diet that is about 4 percent by weight in cholesterol. It would be very similar to having a Big Mac 5-6 times a day,” said Dr. Kithcart. As research on these fish continues, they represent an endless opportunity for innovation and new discoveries. From cancer to aging, blood clots to heart attacks, these fish will help the scientists of the future to discover new treatments and perhaps even answers to some of medicine’s most pressing questions. Thank you, zebrafish, for opening the door for discovery.